Pictured, James T. Hodgkinson who opened fire on Republican lawmakers as they practiced on a baseball field Wednesday morning in Alexandria, Virginia. 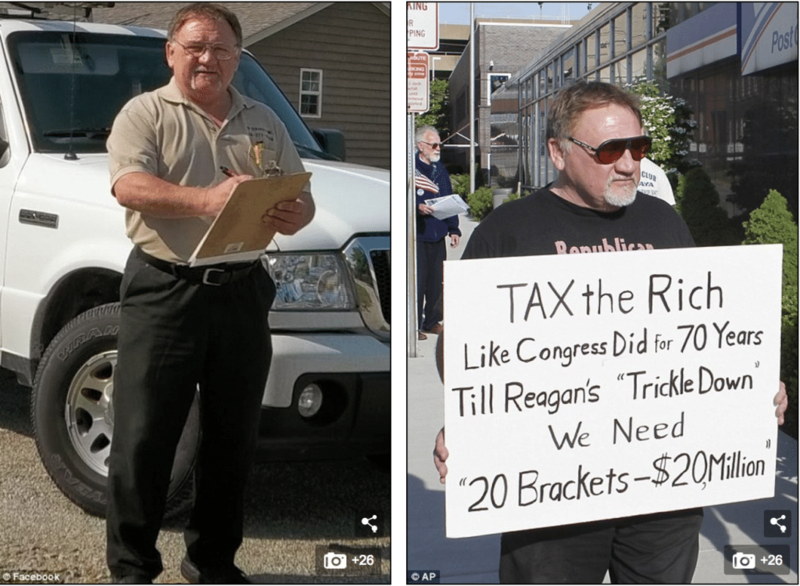 James T. Hodgkinson identified as the shooter who launched a ‘deliberate’ Republican shooting attack. Allied himself with progressive political causes. 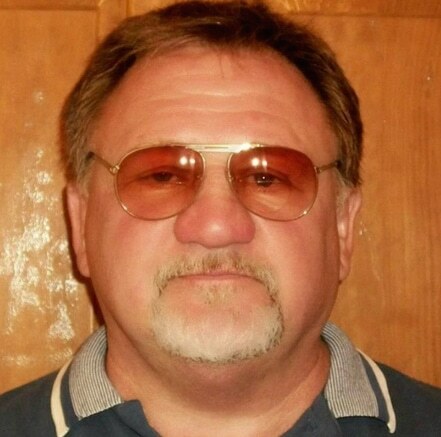 James T. Hodgkinson a 66 year old Belleville, Illinois man who bore great dislike of Republicans has been identified as the shooter who opened fire on Republican GOP members of Congress, Wednesday morning at a baseball field in Alexandria, Virginia, the Washington Post reports. The gunman was shot by two Capitol Hill Police officers who were at the scene as a security detail for Rep. Steve Scalise, the House Majority Whip, who was among those shot. The two police officers were also wounded, along with a staffer for Rep. Roger Williams of Texas. 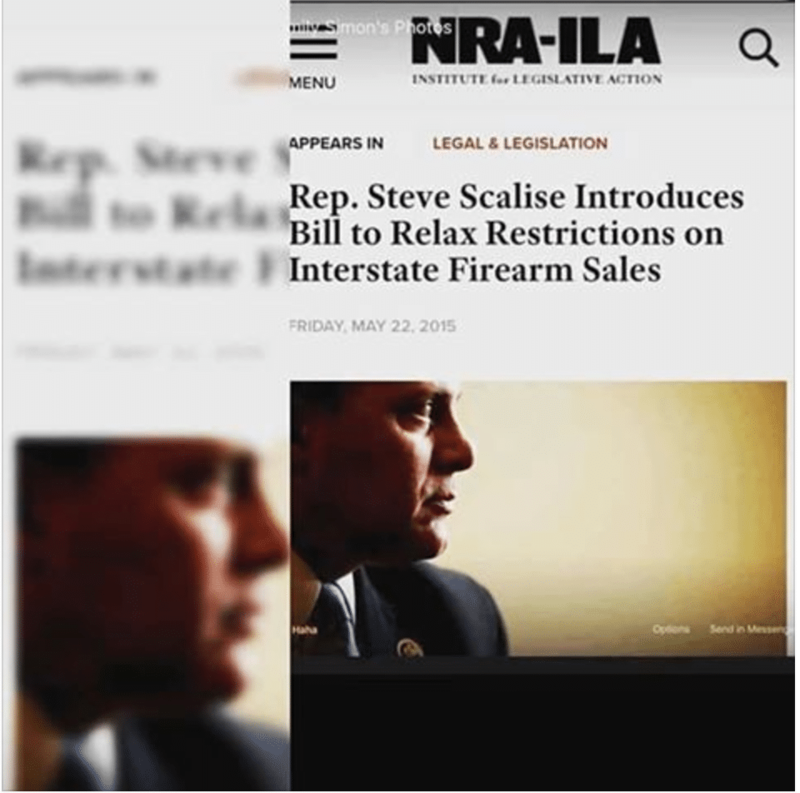 Scalise and the officers are expected to survive. Also wounded was the shooter who was taken to hospital, only to die shortly after. Rep. Mo Brooks told CNN the shooter being a white ‘middle-aged’ man ‘a little bit yon the chubby side’, with a white beard. Sources said the shooting was a ‘deliberate attack’. 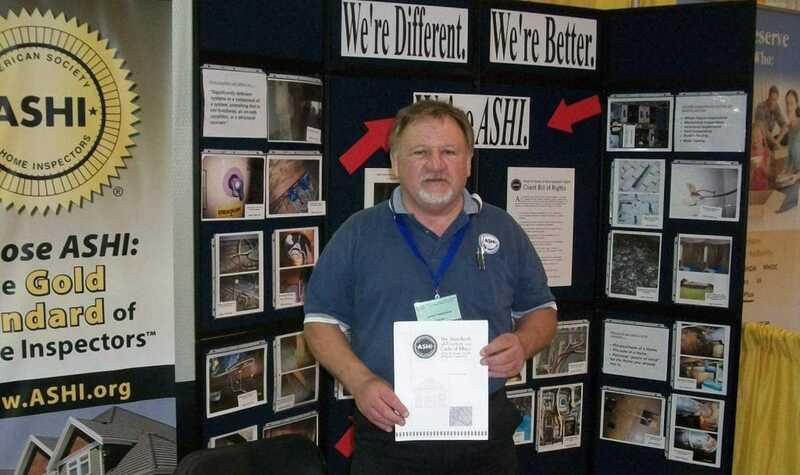 Hodgkinson, a self described ‘Donald Trump hater’ and ardent ‘Bernie Sanders supporter’ was subdued after Capitol Police officers exchanged fire with the gunman who had arrived with reloads of ammunition. At the time of his arrest, Hodgkinson had fired up to 100 rounds from a high power rifle, as he aimed at his targets from the third base dugout at Eugene Simpson Stadium Park. Jamie T. Hodgkinson via Facebook. 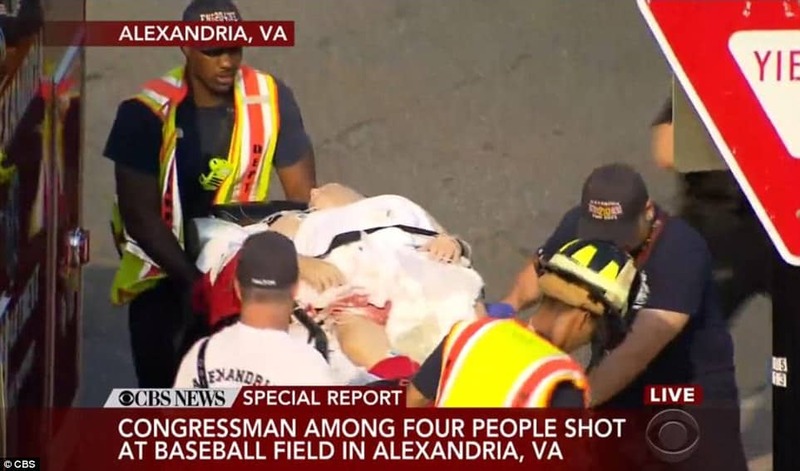 The shooting, which lasted for 10-15 minutes, came as GOP baseball team members had gathered for practice at the pitch at around 7am ahead of their annual game against Democratic congressmen at Nationals Park in Washington, D.C. on Thursday. Told Brooks via CNN, ‘I see a rifle, and I see a little bit of a body and then I hear another bam and I realize there’s still an active shooter. 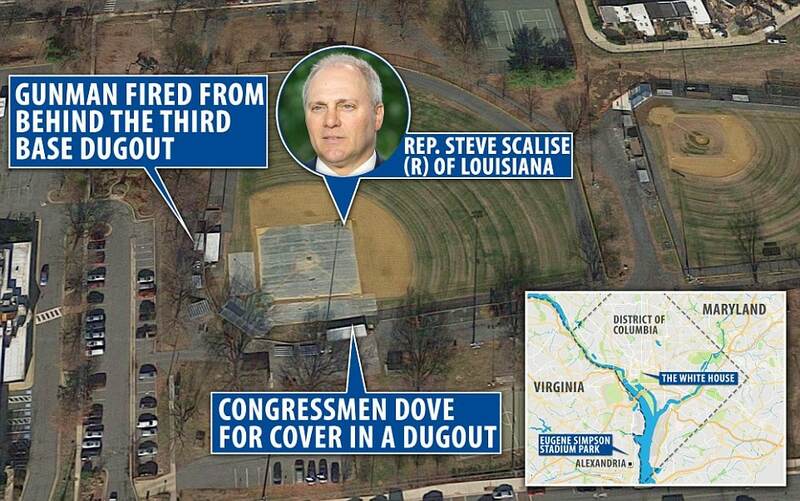 At the same time I hear Steve Scalise over at 2nd base scream — he was shot’. Senator Jeff Flake, of Arizona, sad Scalise dragged himself about 15 years away from second base into right field after he was shot. ‘He was laying motionless out there, but we couldn’t get to him until the shooting had stopped,‘ Flake said. A staffer for Rep. Roger Williams was then also shot, in the leg, Flake said. A target, Jamie T. Hodgkinson couldn’t refuse? Congressmen at the scene are crediting the two Capitol Police officers who were there as the detail for Rep. Steve Scalise, who is the House Majority Whip and has 24-hour protection because he is in the line of presidential succession. Adding, ‘I can tell you that I think with absolute certainty that nobody would have survived without the Capitol Hill Police They saved everybody’s life. Incredibly brave and deserve everyone’s praise, because with this guy, who knows how heavily armed he was, but nobody else had a weapon’. Alexandria Police responded in about 3 minutes, Police Chief Michael Brown said. The city officers joined the Capitol Police in trying to take down the gunman. ‘Two of our officers engaged in gunfire and returned fire,’ Brown said. The Capitol Police officers wounded in the shooting are expected to survive. Hodgkinson, according to his Facebook page owned a home inspection business, JTH Inspections, also called JTH Construction, and studied at Southern Illinois University-Edwardsville. The man appeared to be politically active, citing a variety of causes, including a May 24 Facebook posting asking for signatures on a Change.org petition calling for the Federal Energy Regulatory Commission to stop the NEXUS pipeline. He also signed a petition on May 21 titled, ‘George H.W. Bush: Past Presidents Urge Congress to Launch Independent Investigation,’ and shared that on his page as well. A report via the Belleville News-Democrat told of Hodgkinson participating in a protest outside the downtown Belleville post office in 2012. At the time, the man said he was part of a “99%” team drawing attention to the amount of money and political power the top 1 percent of Americans acquired. Hodgkinson was also a frequent letter-writer to the Belleville News-Democrat. In his letters he advocated for raising taxes on the rich, expressed support for President Obama, and declared his love for The Rachel Maddow Show. Hodgkinson campaigned for Sanders in Iowa while the Vermont lawmaker was running for the Democratic presidential nomination last year, reported the Washington Post. Charles Orear, 50, of St. Louis, who worked alongside him, called Hodgkinson a passionate progressive who showed no signs of violence or malice toward others. He said Hodgkinson is a ‘quiet guy,’ ‘very mellow, very reserved,’ who stayed with him at a fellow Sanders’s supporters home in Illinois. “Trump is a Traitor. Trump Has Destroyed Our Democracy. It’s Time to Destroy Trump & Co.” – James T. Hodgkinson. A fan of @CNN and @MSNBC. Of note, other Facebook posts included Hodgkinson saying he was anti-Hillary Clinton. ‘Bernie is a Progressive, while Hillary is Republican Lite,‘ he wrote. It isn’t the first time that Hodgkinson has been in trouble with the law, in April 2006 the shooter was charged with battery and aiding damage to a vehicle in St. Clair County, Illinois. The charges were dismissed and no other details about the incident or his criminal background were immediately available. 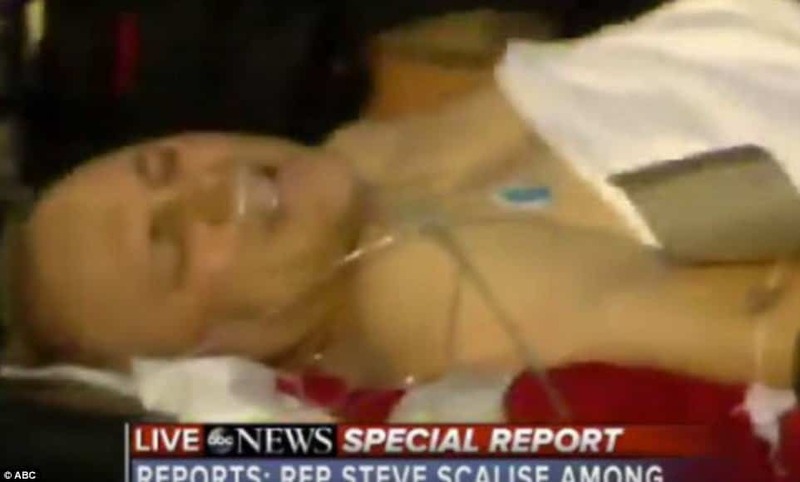 In the aftermath of the shooting, Scalise’s office released a statement stating that the Congressman was undergoing surgery Wednesday morning at MedStar Washington Hospital Center. The statement said Scalise spoke to his wife, Jennifer, on the phone, and was in ‘good spirits’ prior to entering surgery. The shooting is the first involving a member of Congress since then-Arizona Rep. Gabby Giffords was attacked in January 2011 at a “Congress on Your Corner” event in Tucson. Giffords was shot in the head, but survived, while six others were killed and 12 were wounded. The gunman pleaded guilty in 2012 and was sentenced to life in prison without parole.